Fundraising is a very integral and important part of the Gloucester Skating Club as it helps to keep ice and program costs reasonable for everyone, at every level of skating. The Club supports a number of fundraisers listed below. Spread the word throughout your community! If you have an idea for a fundraiser, please contact the Club office at 613-830-1610. For information on the GSC Sponsorship Package for 2018-2019 please contact fundraising@gloucesterskatingclub.ca. 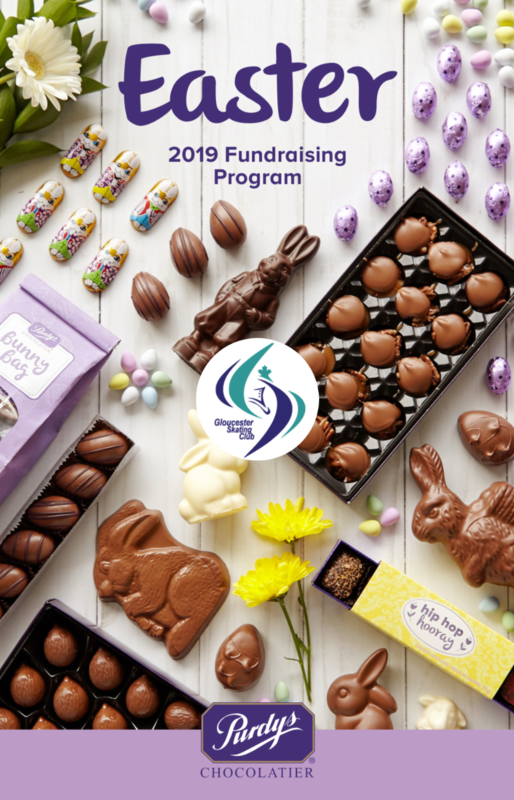 Gloucester Skating Club is fundraising with Purdys Chocolatier, just in time for EASTER! This is a great fundraising opportunity for the club with up to 25% of proceeds going to the Gloucester Skating Club. Why not get the Easter chocolate shopping done from home this year! If you’d like to support us by purchasing some very sweet gifts for friends, family and yourself, please follow the instructions below. After creating a new account (or signing in if you already have an account) you can begin buying chocolates! Click the “SHOP ONLINE” tab and choose either the Online Order Form or Marketplace method to get started. Both methods allow you to choose from the same selection - the Marketplace offers pictures and descriptions. Proceed to the checkout when you have your order(s) ready. Orders will be shipped to the Gloucester Skating Club. Click the “SEND INVITES” tab to invite your friends or family to join in on the fun and help support the club! Orders can be picked up at GSC on: April 13th, 2019 - to be confirmed. Register for FundScrip, the program that turns everyday purchases into earnings. This program allows you to earn money on the items that you normally buy on a regular basis while helping to support your athlete’s development financially. It’s a WIN-WIN for all! Register online – it is Free and easy! Go to www.fundscrip.com Click on “Support a Group” (top right hand corner), provide the sign up information required. You will be asked to enter GSC’s invitation code, which is: HPL6DY. Confirm your Sign up (you will receive an email at the address you signed up with). Buy Gift Cards from over 150 retailers (e.g. Superstore, Loeb, Esso, Petro Canada, Sears, Starbucks, Canadian Tire, etc.). Orders can be made online every two weeks with payments made by Electronic Fund Transfers, Online Bill Payments, or Credit Card. Purchase groceries, gas, clothing, etc. as you normally would with Gift Cards. FundScrip pays back a % of Gift Cards purchased (percentages range from 2% to 15%). Note: Credit card purchases are charged an additional fee of 2.25% and are therefore NOT RECOMMENDED! GSC will allocate 65% of the Club’s earnings to individual skaters’ accounts calculated based on their monthly purchases. These earnings can be put towards your child’s ice fees! The other 35% will go to support the club. Check out these great retailers - there are over 175 stores to choose from! PLEASE NOTE: There is an annual $20 participation fee for this program. You will see the charge on your statement of account as you would any other charge. No chocolates to sell, no cars to wash, no restaurant receipts to collect! Just purchase a MAGAZINE SUBSCRIPTION from one of over 500 choices, at up to 85% less than magazine stand prices, and the club will receive up 37% of the subscription price. Here is an example of how it works. People Magazine costs over $4 at a national retail store, but you only pay $2.26 per magazine with a 19 issue subscription and the club will receive a share of the subscription price. Subscriptions also include e-versions which can be read on phones, tablets and computers. Too easy! Magazines are a great gift idea for the family member or friend who has everything! Enjoy your sports news, entertainment gossip, food magazine while supporting your club. Most subscriptions include the online version too so you can read your magazines on the device of your choice. Share this great deal with family and friends – all sales support the Club.